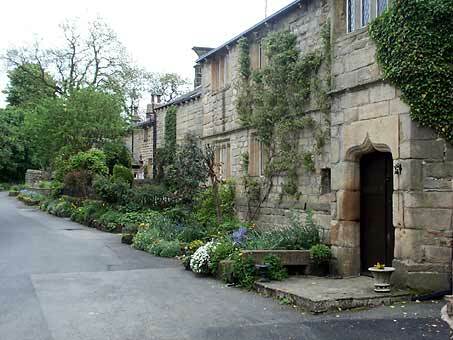 Wycoller Hall, (move your mouse over the photographs for captions) is thought by some to be the inspiration for Ferndean Manor in the novel Jane Eyre written by Charlotte Bronte. 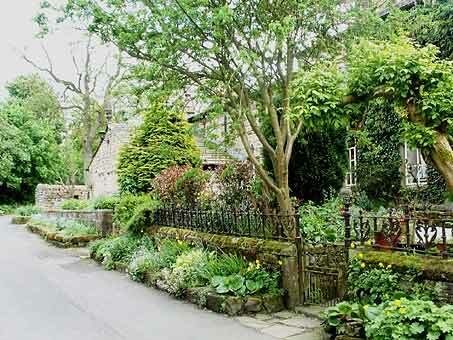 The Brontes spent much of their life in Haworth, close to Wycoller. The Hall was built by the Hartley family at the end of the 16th century but by the early 1900s much of the Hall was unoccupied. Stone was later taken from the property to be used in other locations or for local walls. 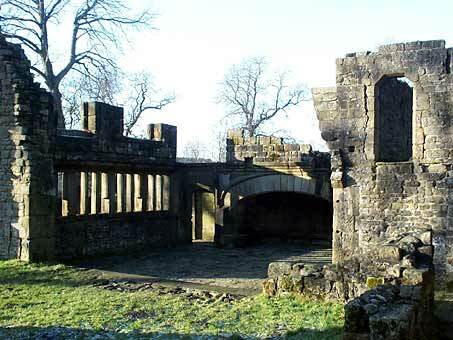 Restoration work on the Hall began in 1950 and the fireplace (picture 4 above) has been rebuilt with help from 'The Friends'. Wycoller's population peaked at 350 in the year 1820 but weavers later moved to live in nearby towns, close to the developing mills. Thirty five dwellings have been lost since that time. Houses that remain have been restored, as evidenced by the superb properties above. 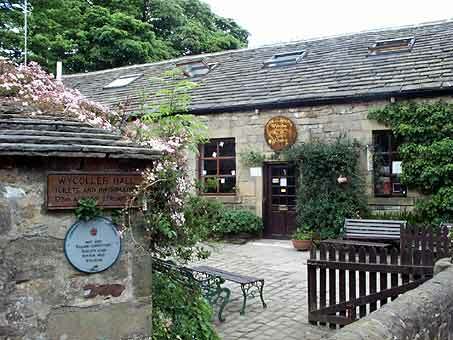 Wycoller Cafe and Craft Centre (picture 4 above) has pleasant proprietors and serves good meals at reasonable prices. 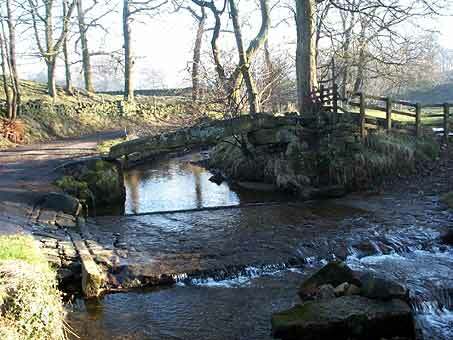 Seven bridges cross Wycoller Beck. Three of the most important are shown above. Pictures 1 and 2 are the Pack-Horse Bridge, a twin arched bridge which may have originated almost 800 years ago, but has been reconstructed over the centuries. Sally Owen, mother of Wycoller's last squire has led to the bridge's alternative name - Sally's Bridge. 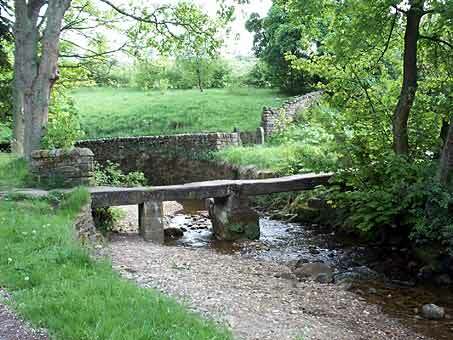 Clapper Bridge is close to the ruins of Wycoller Hall and probably dates from the late 18th or early 19th century. Grooves in the bridge from the weavers' clogs were allegedly chiselled flat by a farmer whose daughter was fatally injured on the bridge. Clam Bridge is possibly more than 1000 years old and is listed as an Ancient Monument. It is a single slab laid across Wycoller Beck and once had a handrail. In 1989 and again in 1990 the bridge was swept away and cracked in two. It was repaired and replaced in 1991. The leaflet 'Wycoller Country Park', published by Lancashire County Council - (Lancashire County Planning Department and County Public Relations Section) is acknowledged in the compilation of text for this web page. Copies are available from Wycoller Cafe and Craft Centre. The very informative leaflet gives an in depth history of Wycoller, its flora and fauna and a map of the area, showing footpaths (including footpaths for the disabled) and bridleways. 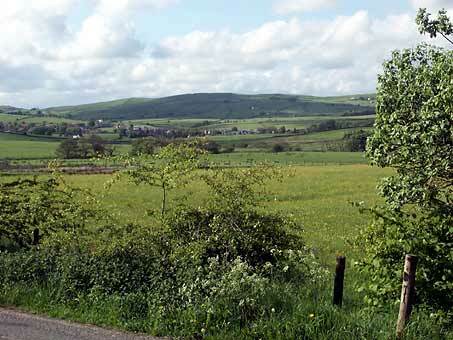 Note:- All photographs of Wycoller were taken by the webmaster of Beautiful Britain. 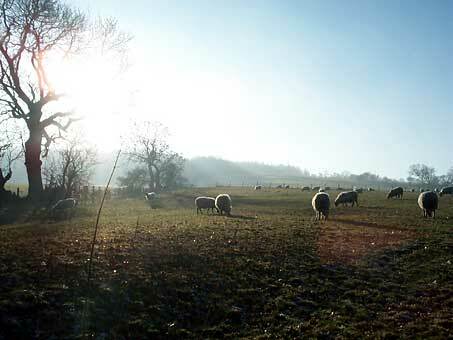 A message from the Secretary of the new "Friends of Wycoller" formed in 2010. 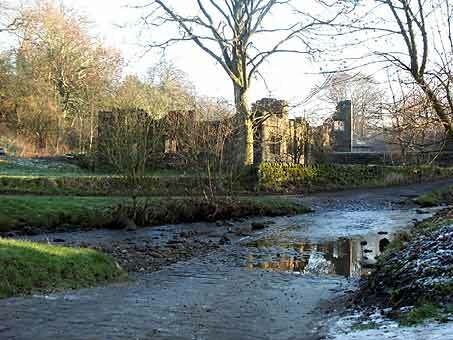 We are very active on projects to enhance Wycoller Country Park. To date we have restored the wild flower garden and the tree trail, developed walks in the park and are currently working on "miles without stiles" walks which should be ready shortly. We have set up a "Wildlife Watch" group in partnership with the Wildlife Trust, for children 8-13 years, to nuture interest and respect for all creatures in the wild. 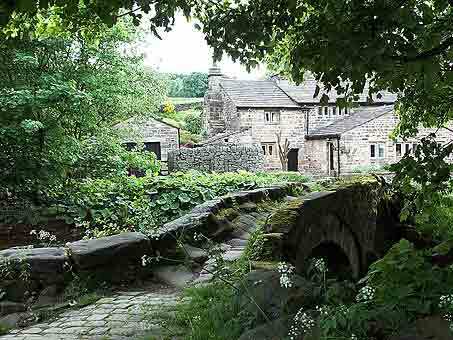 We have also created bat walks and a ghost walk this being to highlight the history of Wycoller through its myths and legends. Our first fund raising event (last year) was opened by the only surviving member of the original friends now aged 97 years. What a fantastic moment. So, as the original Friends of Wycoller feature on your website and we have their blessing and hope to work hard in the interests of wycoller as they did, I hope you can include the reformed friends of wycoller web link on your page.